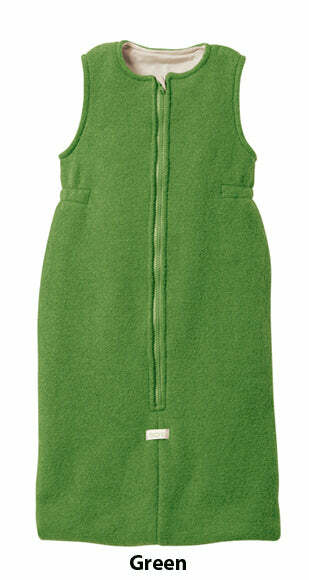 Disana Boiled Wool Sleeping Bag. Made in Germany. Soft and lovely boiled organic fine merino wool outside. Soft organic cotton inside. Warmth and comfort. The warmth of boiled wool is not at all like sweaty polyester. Wool breathes and regulates body temperature. I am convinced that my babies sleep better in wool and natural fibers, perhaps because they are neither too hot nor too cold in it. This really does have that Goldilocks effect of "just right". There is something amazing and superior about merino wool. The organic cotton lining inside is soft, too. This is not intended as a diaper cover. It is clothing. 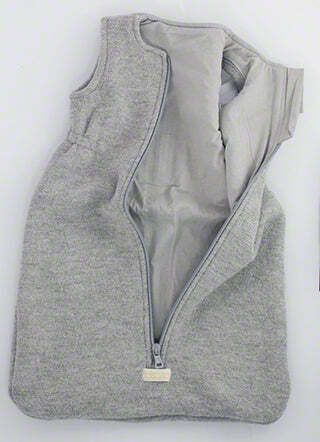 The front zipper opens up all the way for easy access to baby. This new stock version has a new added detail which is cotton at the top covering the zipper. Please note that the pictures, except for the grey picture, don't show this zipper cover near the chin but ALL of our stock does have this nice added feature. The top of the zipper is very well covered by organic cotton, which makes good sense. Handwash only. Made in Germany. 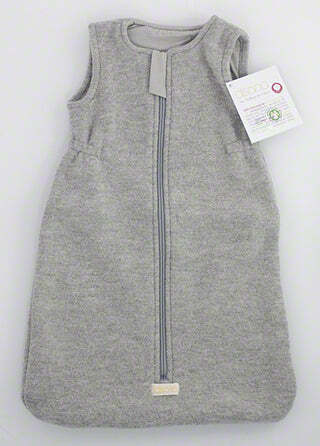 All of our stock has the new cotton zipper cover near the baby's chin, but the stock pictures below don't show it. The pictures don't do this justice. It is much nicer than it looks in the pictures. Warm boiled wool on the outside, extra-fine organic cotton on the inside. Our boiled wool Disana sleeping bag combines the best of both natural fibers. 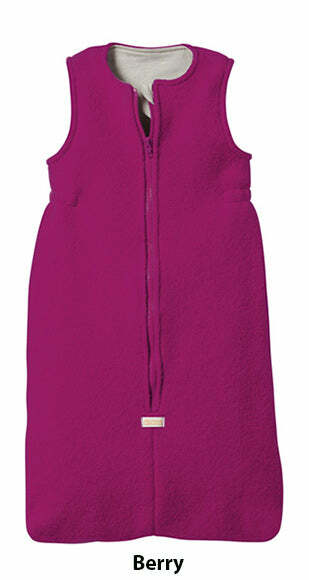 The outside, made of soft new boiled Merino wool, provides plenty of warmth without overheating. Wool is very good at balancing out the temperature; you are never too warm or too cold wearing it. An extra fine organic cotton lining on the inside allows the child to sleep in peace. Thanks to the long zip the front of the sleeping bag can be opened wide. This makes it easier to place your child inside when she is asleep. A priceless advantage for little ones after a long day of adventures, play and discovery. Size 1: From back of neck to bottom is 23 inches. From front neck opening to bottom is 21 inches. Size 2: From back of neck to bottom is 33.5 inches. From front neck opening to bottom is 31 inches. Size 3: From back of neck to bottom is 41 inches. From front neck opening to bottom is 38.5 inches. I don't fancy myself as someone who spends this much on baby items, but after plenty of experience with sweaty yet chilly fleece sleep sacks I decided to give this a try. We live in upstate NY, and this has been absolutely perfect for our January nights, plus it has a nice heft to it that my baby seems to like. My son just turned one and is about the 25th percentile- he has plenty of room to grow in the size 2 . The cover on the zipper pulls works great on ours, and I'm not concerned about the cotton lining because my wool soakers never leak. If I ever have another babe I'll definitely be investing in size 1 and tossing all those pilly fleece sacks so they can sleep in one of these right after graduating from the swaddle! I bought this for my newborn grandson because the nights have been getting much too cool for him. The boiled wool sleep sack is perfect! It helps keep him warm and cuddly and my daughter said he is sleeping so much better. She puts him in a cotton romper with the disana wool romper over it and then into the sleep sack. I think I am jealous! This sleeper is awesome! So glad we made the investment. We have used sleep sacks exclusively for all of our children after transitioning out of swaddling. We had always used cotton sleep sacks in the past, from several different manufacturers, and were generally happy with them. However, after 3 kids, the cotton started to fray at all the edges and much of the loft in the insulated types started to compress, so they were no longer warm. I decided to try a wool sleep sack, and I wish I would have made the switch sooner! This sleep sack has been amazing. It doesn't need to be washed as often, and the wool looks brand new, even after using it for every nap and overnight for three months. The interior is soft cotton knit, which is comfy, and the boiled wool outer is soft also. We usually keep the bedroom temperature around 65, and my baby stays warm in this sleep sack. She also wears a wool shirt, wool pajama pants, and socks under the sleep sack at night. The elastic waist gathers are a great feature. It keeps the sleep sack centered on the baby, and we haven't had problems with the sleep sack riding up over the baby's face. The zipper is not inverted as in many other sleep sacks. There is a zipper flap cover at the neck line, which mostly covers the zipper pull. At the moment, my baby doesn't seem to care about the zipper pull, but I wonder if she may try to mess with it when she's older. I would prefer an inverted zipper for this reason, but overall this is a minor problem. That's the only reason I'm not giving 5 stars. My baby is 8 months old and around 17 lbs. She is currently using the size 2, and it fits well, with plenty of room in the length as she grows. I'm planning to purchase the next size up for my 3 year old, and I'm sure it will be in perfectly good shape to hand down to my baby. I'm giving all of my cotton sleep sacks away!